Blue Sky BuildersSkywriters Garage BlogBlue Sky BuildersWhat Roofing Terms Do I Need to Know When Replacing My Garage Roof? Most home and garage roofs in the Chicago area require replacement of their asphalt composite shingles every 20 to 30 years, but the actual life of the roof can be shorter or longer depending on the quality of the shingles, the amount of direct sun they get, and other weather-related factors. The surface of the shingles looks cracked or crackled. The granules on top of your shingles have eroded away to the point that you can see any bare black surface below. Edges of shingles are curling upward or cupping. The shingles are brittle to the touch and crush into bits easily rather than being flexible. If you have never had to replace a shingle roof before, here are some terms you should know. Ice dam: Chicago’s winter freeze/thaw cycle can cause ice dams to form on a roof. An ice dam is a layer of ice that builds up on a vulnerable part of the roof and prevents melting water from flowing down and off the roof as it should. Ice dams are a hazard, because they can allow water to back up above the dam, work its way under the shingles, and leak inside the building. Ice dams commonly build up on the edges of the roof, in valleys, and along ridgelines. Structure: The structural components of the roof are the walls and the framing beams that lay across the walls and form the peak of the roof. Sheathing: This is a layer of plywood or similar material that sits on top of the roof beams. Sheathing must be a continuous flat surface with no gaps between the boards. It is sometimes referred to as roof decking. Ice/water barrier membrane: Building codes require the installation of an ice and water shield on top of the wooden sheathing in areas of the roof most vulnerable to water leakage from ice dams, including ridgelines, valleys, and roof edges. An ice/water barrier is an adhesive-backed membrane of 24” to 36” wide that seals over nail holes in the sheathing that water could seep through. When applied along the exterior edges of the roof, the membrane should extend at least 24” inside the exterior wall line. While some city codes do not require the use of ice/water barrier membranes on detached, unheated garages, some areas recommend it on all garages. Metal flashing: Flashing is another building material that is crucial to prevent moisture from seeping through roofs and walls, particularly at points of intersection, such as roof peaks and valleys and around skylights and chimneys. Flashing is made of galvanized steel which is bent to conform to the peak or valley it is protecting. Drip edge: This special type of metal flashing wraps around the lower edge of the roof sheathing all around the entire building. A drip edge prevents water from making contact with the edges of the wood sheathing that would otherwise be exposed. It also directs water away from the fascia trim that runs along the lower edge of your roof. The drip edge and the ice barrier membrane work together to prevent water from reaching the wood sheathing and leaking inside the building. Without the drip edge, a driving rain could force water under the shingles at the edges of the roof. The metal drip edge also seals any gaps between the fascia and sheathing to prevent the entry of small animals. The drip edge also works in combination with gutters to direct water away from the building. Shingles: Most roofs are covered in asphalt composite shingles that are nailed on top of the sheathing and water-barrier materials. Today’s shingles are composed of several materials, generally a fiberglass mat covered with water-repelling asphalt and colorful mineral granules. The shingles are backed by a heat-activated adhesive strip that helps bond the overlapping layers of shingles together. 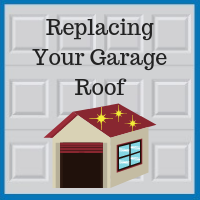 If your DuPage County garage roof looks ready for replacement, call Blue Sky Builders in Downers Grove. We have been building and repairing garages in Cook County and DuPage County for 40 years, so we have the experience you need to get the job done right. We take the time to update our construction knowledge every year so that we are using the latest and best practices for installing the materials we use. Call us at 630-852-8485 for a free estimate.